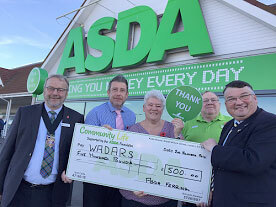 Wadars animal rescue would like to say a big thank you to customers of ASDA’s Ferring supermarket after coming out on top of the store’s Green Token Scheme. Customers are given tokens at the till that they can put in a box of their choice at the front of the store, and Wadars was one of three charities that customers could choose from between June and August. The animal charity received hundreds more tokens than the second placed organisation. Anyone interested in adopting an animal from Wadars or supporting the charity should call them on 01903 247111. 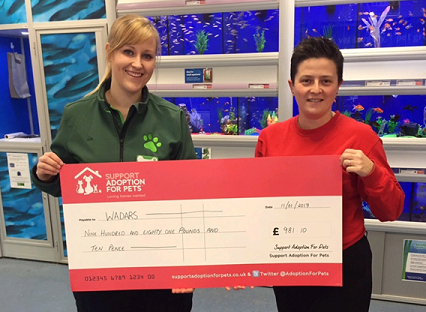 A big thank you to the staff and customers at Pets at Home Worthing who raised over £981 for Wadars through their Santa Paws campaign during December. Wadars rely heavily on the support of locally based businesses to raise funds which enable us to continue to run our vital services. 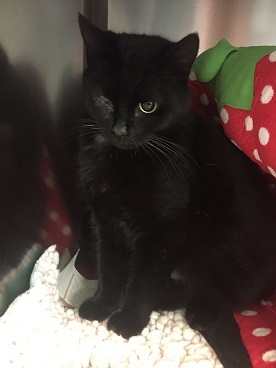 We are appealing for donations to help cover the cost of an emergency operation to remove the badly injured eye of a stray female cat. The heavily pregnant cat – nicknamed Bluebell by staff at Grove Lodge vets – was picked up by Wadars on Wednesday (8th February) following a call from a member of the public, and had been living rough under a camper van in Goring for about a year. The cost of the treatment that Bluebell has had so far and the operation to remove the eye will cost the charity between £450 and £550. On veterinary advice the operation is being carried out today (9th February) in advance of Bluebell giving birth, which she is likely to do in the next week. Anyone wishing to make a donation to help with Bluebell’s operation and on-going costs should either click on the Make a Donation page of this website, or send a cheque made payable to ‘WADARS’, to Wadars, Hangleton Lane, Ferring, BN12 6PP.